During her short time as a ward in Queen Marguerite's Lancastrian court, fifteen-year-old Isobel has had many suitors ask for her hand, but the spirited beauty is blind to all but Yorkist Sir John Neville. It is nothing short of a miracle when the Queen allows Isobel's marriage to the enemy, albeit at a hefty price. All around Isobel and John rages a lawless war. It is only their passion that can see them through the bloody march on London by the Duke of Somerset, the violent madness of Queen Marguerite, and the devolution of Isobel's meek uncle into the Butcher of England. For theirs is an everlasting love that fears not the scratch of thorns, from either the Red Rose or the White. I’ve been hearing lots of things about Sandra Worth and when the opportunity came to read this book I couldn’t let it pass. Especially as it is set during the Wars of the Roses which is a period in the history of England that I like to read about. Lady of the Roses is about Isobel, a young heiress who grows up a ward of the crown – the crown being Queen Margaret of Lancaster – but falls in love with John Neville, a member of the House of York and brother of Warwick the Kingmaker. For a while they looked like star-crossed lovers that wouldn’t be able to overcome the enmity between Lancaster and York but after the Neville family pays a large amount for her Isobel is allowed to marry John. I did enjoy knowing their story and I think Worth expertly engages the reader in her tale, I can’t remember when it was that another book made me run to the nearest encyclopaedia to know who was who and what happened when. Although I have already read several books set in the period I don’t think I had ever payed much attention to John Neville in a family where several people have the same name is really useful to have a family tree in the beginning of the book. While Isobel is the main character, I think it is John that emerges as the voice of reason and the symbol of honour in a difficult period. The way Worth describes him made me think of SKP’s The Sunne in Splendour and Richard III. Maybe, just maybe, they are a bit too good to be true but making them so human certainly makes for wonderful characters. 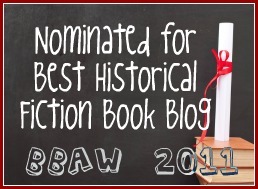 By marrying John Isobel joins one of the most powerful families of the land at the time and through her eyes we see the main political events of the time. Anyone interested in knowing how the Wars of The Roses started has a good explanation here. Although I can’t really vouch for all the details being correct I think the main idea is the right one. The only thing I wasn't too happy with is that the two queens - Margaret of Lancaster and Elizabeth Woodville - sound a bit too bad to be true, not that they couldn’t possibly have been that bad (and mad in Margaret’s case) but I think they must have been more subtle about it. On the other hand, I felt the same about Isobel's uncle and it seems he really was as bad as Worth describes him so maybe those two were that way too. A very interesting read with the "holes" in history being nicely filled with story. This is a book that I haven't heard of, but have heard a lot about the author lately. It sounds like a very interesting story. 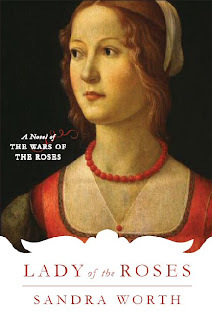 I haven't really read anything yet about the War of the Roses period, but I will hopefully be changing that soon! Prior to reading The White Queen by Philippa Gregory I was clueless about the War of the Roses, so I'll have to keep this one in mind if I want to read more about the time period. Glad to know that you liked this book. I don't know much about the War of the Roses, but it looks like this might be a great book to start with. Like the poster above I am planning to read the new Phillipa Gregory book, but I might try this one first. Thanks! The war of the Roses never gets old does it? Thanks for the recommendation. I like to read books that make me seek out more history, and I've always been curious about how it all started. Sounds wonderful! I love your blog and your reviews are very good.